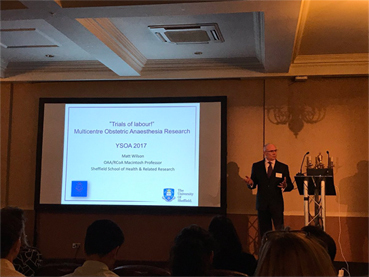 The YSOA began life as Obstetric Anaesthesia Study days run at Hull and York to fill a gap in the educational calendar on the East Coast/Yorkshire. Very quickly these study days integrated into the annual Hull York Study day which became a regular fixture. It also created a nucleus of keen obstetric anaesthetists. This group keenly felt the need to have a formal society and thus the YSOA was born. The scoiety was formally constituted in October 2012. Our first annual scientific meeting in April 2013 This program held at Harewood House near Leeds was very well attended. The Annual Scientific Meetings are very much a centre piece of the YSOA activity. These are designed to provide updates in matters relating to obstetrics and obstetric anaesthesia in the UK. It is hoped the meeting will be a useful resource for non obstetric anaesthetists to update their knowledge base.